There’s a theory that trends happen first in California before spreading to the rest of the nation. If that’s true in health insurance, we’re all in deep trouble. Last week, Anthem Blue Cross—whose parent company WellPoint posted a record $4.7 billion profit in 2009—announced it was gouging even more money from its 800,000 California customers by raising premiums as much as 39 percent. but it is not out of character for an industry engages systemically in price gouging and denial of care. At a press conference this week, President Obama told reporters Anthem’s rate hike makes the need for health care reform even more clear. if we don’t act, this is just a preview of coming attractions. Premiums will continue to rise for folks with insurance; millions more will lose their coverage altogether; our deficits will continue to grow larger. 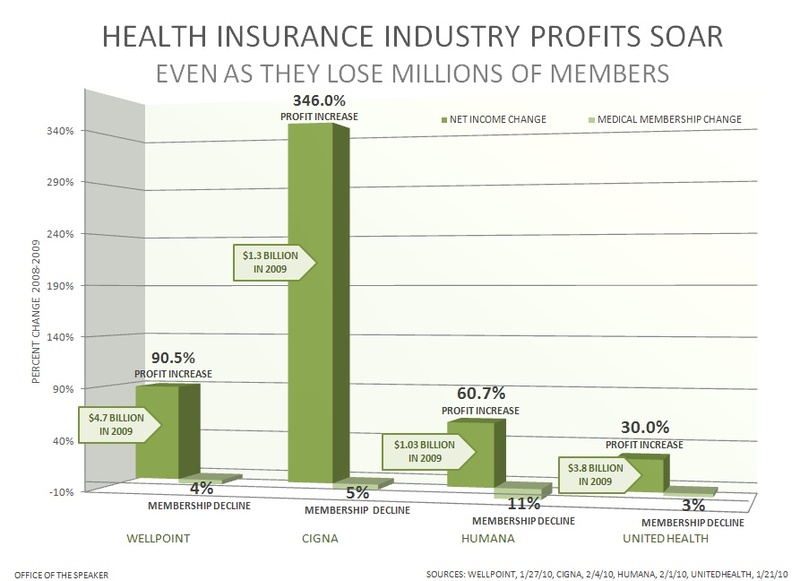 raking in billions in profits each year, while policyholders struggle to make ends meet in this tough economy. Insurance companies can raise premiums or slash benefits, and there’s not much families can do about it, especially if they have preexisting conditions that would make it hard to get other coverage….What’s happening in California can happen in any state. Sebelius and congressional leaders are demanding answers. In a letter to Anthem President Leslie Margolin, Sebelius says the company must provide justification for the rate hikes. The extraordinary increases are up to 15 times faster than inflation and threaten to make health care unaffordable for hundreds of thousands of Californians, many of whom are already struggling to make ends meet in a difficult economy. Your company’s strong financial position makes these rate increases even more difficult to understand. As you know, your parent company, WellPoint Incorporated, has seen its profits soar, earning $2.7 billion in the last quarter of 2009 alone. A table listing all proposed premium increases from January 1, 2009, through December 31, 2010, in the individual health insurance market for all WellPoint subsidiaries, including the amount of the proposed premium increase, the subsidiary, the state affected, and a detailed explanation of reasons for the increase. This article originally appeared on the AFL-CIO blog.